© Harmsen and Huijsmans; Licensee Bentham Open. We conducted a review of the literature through a Pubmed search. 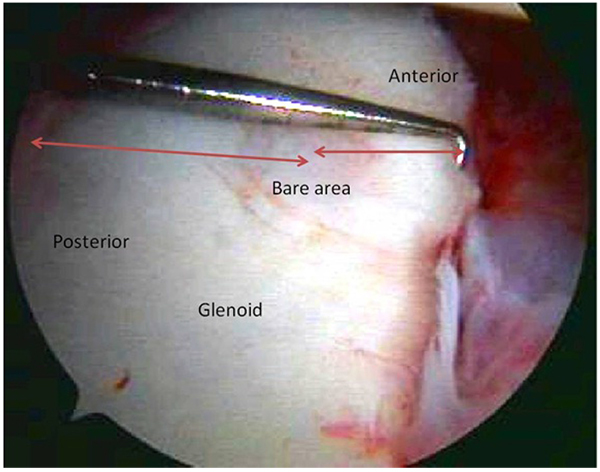 Results: The management of glenoid defects in anterior shoulder instability consists of conservative or operative treatment. There is a wide variety in the treatment options. Also, the diagnostics of the presence and size of a glenoid bone defect is still debated on in literature. Conclusion: Based on the current available literature, we advise to begin management of traumatic anterior shoulder instability combined with glenoid defects with conservative treatment. Operative treatment can be used when the bone fragment consists of a large glenoid surface and the patient is active, or in the case of a chronic defect or recurrent instability. Keywords: Anterior shoulder instability, Bone defects, Glenoid defects, Trauma, Treatment, Surgery. 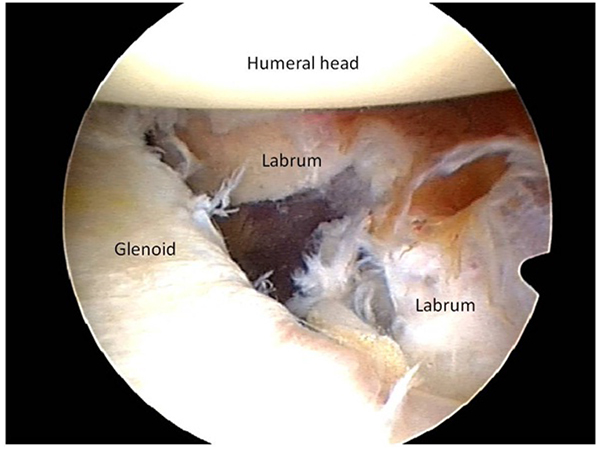 Bone defects of the glenoid are often found, alone or in combination with humeral bone defect, in patients with traumatic anterior glenohumeral instability [1, 2]. Bone defects of the glenoid can result in ongoing instability and recurrent dislocation because of diminished congruency of glenohumeral joint surfaces and their function as static glenohumeral stabilizers. Bone defects of the glenoid can be found in up to 50% of patients with recurrent anterior glenohumeral instability . In patients with significant bone loss of glenoid and humeral head the general recommendation is that reconstructive surgery of the bone defects is performed [4, 5]. The stability of the shoulder joint is mainly provided by the capsuloligamentous structures, biceps tendon, rotator cuff and glenolabral complex. The bone congruency of the humeral head and glenoid play a less important role in the stability of the shoulder joint, compared to the ball and socket of the hip joint. Cadaveric studies have showed a significant instability with a glenoid bone surface loss of 21% . They describe the stability of the shoulder in relation to the size of the bone defect. When no surgery is performed an increased bone defect leads to progressively decreased stability of the shoulder. The anteroinferior stability after Bankart repair however is not influenced by the size of the bone defect when the arm is in abduction and external rotation. The soft tissue in this position is tensioned and provides sufficient stability. Conversely, when the arm was in abduction and internal rotation (no tension on soft tissue structures), the anteroinferior stability of the shoulder decreased as the size of the osseous defect increased. The loss of glenoid bone must be quantified by standard measurement protocols . Their estimations have shown to give poor correlations with actual measurements of glenoid defects. Fig. (4) shows intra-operative measurement of the glenoid bone defect, whereas Fig. (1) shows the more accurate 3D-CT circle method. Fig. (1). 3D-CT Circle method, imaging and measuring the glenoid bone defect. The red circle represents the intact glenoid, the yellow circle (B) represents the missing part/defect. Fig. (2). Anterior glenoid fracture with large bone fragment. This article is focused on the treatment of glenoid bone loss. Other articles in this issue will describe anatomy, physical examination, imaging and posterior instability. Bone defects of humeral head, closely related to the subject of our review, will be described in the next article. Although significant glenoid bone defects rarely exist in isolation. The prevalence of bone defects in patients with anterior instability varies in the literature depending on the classification criteria of bone lesions utilized. In patients with first-time anterior shoulder dislocation, glenoid defects have been found in up to 22% . In patients with recurrent anterior glenohumeral dislocation, glenoid bone loss, including fracture or erosion of the glenoid rim, has been found in 49-86% of patients . The aim of this review is to describe the current concepts of the conservative and operative treatment of glenoid bone defects in anterior shoulder instability, both due to traumatic lesions as well as chronic glenoid bone deficiencies. In studies on traumatic glenoid bone lesions authors often divide the bone loss in three groups. Small bone loss, less than 15% of the glenoid surface, an intermediate group between 15 and 30% of surface loss and the group with larger than 30% surface defects . It is generally advised for the last group to perform a type of bony procedure . The exact role of these findings is still subject to discussion, some authors found a relationship between the presence and size of a glenoid defect and re-dislocation after Bankart repair [12, 13], where others could not confirm this relationship [14, 15]. Besides, the amount of bone loss, the demands of the patient on the shoulder will determine the next step in the treatment plan. Low demand patients may benefit from conservative treatment, as well as the patient with high intra-operative risk. Also, a soft tissue procedure may be a successful treatment for low demand patients . Even in the group with active and young patients one could start with conservative treatment. Bigliani et al. described a group of 25 patients treated surgically who sustained recurrent instability, after a sports related injury. These patients were part of a cohort of 200 patients who were initially treated conservatively. Resulting in satisfactory conservative treatment in almost 90 percent. In their group one coracoid transfer was performed for a patient with bone defect more than 25%. Sixteen patients had a displaced avulsion fracture with attached capsule; five had a medially displaced fragment malunited to the glenoid rim and three erosion of the glenoid rim with less than 25%. Maquieira et al. also described successful conservative treatment after traumatic anterior dislocation of the shoulder, associated with a large (more than 5 mm, and more than 2 mm displaced) glenoid rim fracture, providing the glenohumeral joint is concentrically reduced on the anteroposterior radiograph. There were no redislocations, subluxations or symptoms of osteoarthritis in a mean follow-up of 5.6 years in their group of 14 consecutive patients, with a mean age of 53 years (32 to 73) at the time of injury. All fragments healed with an average intra-articular step of 3.0 mm (0.5 to 11). Due to the repetitive (sub)luxation the recurrent anterior instability can lead to glenoid bone loss which is clinically significant. Recurrence rate of anterior instability with significant bone defects was 67% after arthroscopic Bankart repair, reported by Burkhart and DeBeer , compared to 4% recurrence rates in those without significant bone defects. They describe significant bone defects as an inverted-pear glenoid, in which the normally pear-shad glenoid lost significant anterior-inferior bone to take shape of an inverted pear, or an ‘engaging’ Hill-Sachs lesion of the humerus. To help determine a clinical significant bone loss the 'inverted pear' concept has been introduced by Burkhart and De Beer . Where the pear shaped glenoid, seen during arthroscopy, can transform into an 'inverted pear' when a fracture, or recurrent dislocation causes the anterior-inferior (base of the pear) part of the glenoid to disappear. The smallest part of the glenoid is then caudally located and the pear inverted. The concept has been expanded by Lo et al. to be used during arthroscopy. The silhouette of an 'inverted pear' appeared when there was a mean loss of 7.5 mm, which represented a mean loss of 28.8% of the glenoid width. Conservative treatment can be advised in case of a soft-tissue Bankart lesion or a small bone defect, combined with a low demand and/or older patient. Conservative treatment can also be advised to patients with a high intra-operative risk due to co-morbidity and patients who will not be able to follow the postoperative rehabilitation. Immediate bracing in an external rotation position may reduce the rate of recurrence in soft-tissue lesions . Physical therapy will focus on muscular enhancement to maintain a stable shoulder joint and will follow a period of immobilization. The second phase will consist of passive range of motion exercise, followed by active range of motion exercise and ends in strength and endurance exercises. The younger patient is at higher risk for recurrent dislocation as described by Te Slaa et al. in their study of 107 acute dislocations in 105 patients. Age was the most significant prognostic factor in recurrence which took place in 64% of patients less than 20 years of age and in 6% of those older than 40 years. Operative treatment will be indicated in most cases where conservative treatment has failed and patients have not regained sufficient quality of life and an adequate function compared to their situation before the instability occurred, unable to return to their previous level of ADL, work and sports. For the young athletic and active patient operative treatment is recommended because they have a higher chance of failed conservative treatment, as described by Hovelius et al. in their 10-year prospective study on anterior dislocation in young patients [24, 25]. The acute bony Bankart with a substantial bone fragment can be treated with reduction and internal fixation of the bone fragment. Both open and arthroscopic procedures have obtained good results . It is important to achieve an anatomic reduction, which restores the normal biomechanical function of glenoid. Sugaya et al. performed an arthroscopic Bankart repair in a consecutive series of 41 patients with 42 shoulders with chronic recurrent traumatic glenohumeral instability. They perform an intra-articular suture relay, with self-locking sliding knots on the labrum adjacent to the inferior side of the osseous fragment. 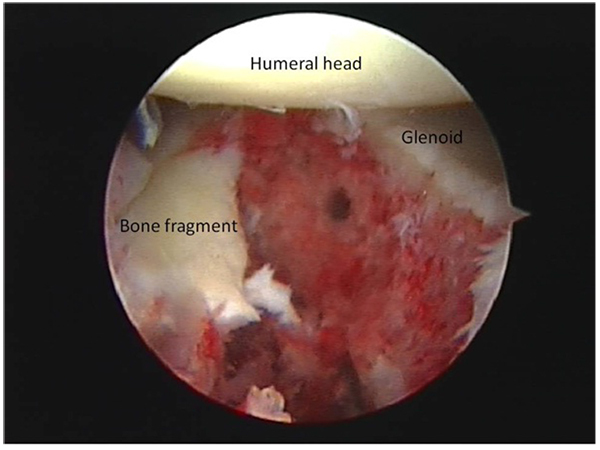 (An intra-operative glenoid bone fragment is shown in (Fig. 2). Also the bone fragment itself is sutured through or around the bone fragment (Fig. 1). Their patients had an average bone loss in the glenoid of 24.8%, and the average fragment size of 9.2% of the glenoid fossa. After a follow-up period of 34 months 39 of the shoulders were rated good to excellent, the mean Rowe score improved from 33.6 to 94.3 points postoperatively. And 35 of the 37 active participants in sports returned to the level of before the surgery. The circle method is used measure the glenoid bone loss, shown in Fig. (1). This method is described in a cadaveric study . Fig. (3). Anterior labrum tear, with absorbed glenoid bone fragment. The isolated Bankart repair is thought to be insufficient in a patient with anterior shoulder instability due to a significant bone deficiency of anterior-inferior glenoid. A defect up to 15% is most likely treated with physical therapy or a soft tissue procedure [29, 30]. The goal of the Bankart repair is reattachment of the capsule and glenoid labrum to the anterior-inferior glenoid rim. Bankart described in 1923 the principal pathology of chronic instability after a posttraumatic shoulder dislocation. The Putti-Platt procedure decreases external rotation by tightening the subscapularis tendon . Due to this decreased external rotation, there is an increased risk of developing posterior subluxation of the humeral head and a higher incidence of osteoarthritis. Therefore this procedure has become obsolete nowadays. Kiss et al. stated that the incidence and severity of osteoarthritis, the incidence of pain, and the limitation of external rotation are significantly increased after the Putti-Platt operation. Salomonsson et al. compared both techniques in a group of 66 patients . After two years of follow-up there was no difference in muscle strength or Rowe score. External rotation was 3 degrees less in Bankart group compared to preoperatively and 10 degrees in the Putti-Platt group (p = 0.03). The 10 year follow-up included 62 of 66 patients and showed 15 patients in the Putti-Platt group with recurrent anterior shoulder instability and 19 patients in the Bankart group. Both groups had a similar small number of patients with a glenoid defect or wear. When performing a soft tissue repair in patients with a glenoid defect, there seems to be an advantage if a bone fragment is still present in the soft tissue. Mologne et al. described a mean follow-up of 34 months in 21 patients in a group of 23 patients undergoing arthroscopic glenohumeral stabilization with a bone defect of the anteroinferior glenoid of 20% to 30%. Two patients had recurrent subluxations and one recurrent dislocations, requiring revision open surgery. Mean outcomes scores (SANE, Rowe, ASES, WOSI) for patients with a bone fragment were better than those where the bone fragment was absorbed (P = .08), and no patient with a bone fragment experienced a recurrent subluxation or dislocation. Fig. (3) shows a glenoid defect with absorbed glenoid fragment. Fig. (4). Intra-operative measurement of anterior glenoid bone defect, showing a decreased anterior glenoid length. The coracoid transfer has the advantage over the remote bone block augmentation of the absence of a donor site, with its potential morbidity. Wellmann et al. and Giles et al. found a biomechanical advantage of the coracoid transfer procedures compared to other reconstructive options as a result of the additive dynamic stabilizing “sling” effect produced by the repositioned conjoint tendon. The Bristow procedure was first described by Helfet in 1958 and named after his mentor, W. Rowely Bristow . He transplanted the tip of the coracoid with the attaching conjoined tendon to the anterior-inferior glenoid rim. Bristow taught Helfet this procedure almost 20 years earlier. An osteotomy is performed of the distal part of the coracoid, just distal to the insertion of the pectoralis minor muscle. A coracoid bone block of 1-2 cm with the conjoined tendons of the short head of the biceps and coracobrachialis attached at their insertion is removed and horizontally attached to the anterior-inferior glenoid rim. A vertical slit is made in the tendon of the subscapularis to gain access to the glenoid rim. The transferred bone block of the coracoid provides filling of the glenoid defect. The still attached conjoined tendon also provides an increased stability of the shoulder joint, especially during abduction, and external rotation as the tendon is tensioned firmly across the anterior-inferior capsule, providing anterior stability (Fig. 3). In a short follow-up study of only 3.5 years Yamashita et al. reviewed 126 patients with recurrent anterior shoulder instability using both a Bankart and Bristow procedure. Due to the short follow-up they reported no osteoarthritis. A recurrence of anterior shoulder instability was reported in only two patients, with a 90% good to excellent result for the whole group. Average loss of external rotation was 13 degrees. A study with a longer follow-up period of 15 years by Hovelius et al. reported a higher incidence of recurrent instability in 16 of the 118 patients, with a high satisfaction rate of 98%. Only one patient required revision surgery. They also evaluated the occurrence of glenohumeral arthritis in radiographic follow-up in 115 patients and found osteoarthritis in 40% of the operated shoulders. Without being able to identify an association between development of glenohumeral arthritis and a loss of rotation, on average 11 degrees in their study population. Schroeder et al. found that 15% of 52 patients had recurrent instability after their Bristow procedure after a 26 year follow-up period. Good to excellent results were reported in 70% of the patients using the Rowe score. Five patients where surgical revised, an intra articular screw was found in two patients, one of them developed recurrent instability. They could not comment on osteoarthritis in this group because of the limited radiographic follow-up. The reconstruction principle of the Bristow procedure can also be performed arthroscopically as described by Boileau et al. An arthroscopic Bankart repair is performed to recreate the glenoid concavity and re-tension the inferior glenohumeral ligament. Then an arthroscopic Bristow is performed: an arthroscopic transfer of the conjoined tendon along with the tip of the coracoid to the anterior-inferior rim of the glenoid and fixated with a bio-absorbable interference screw. The order of both procedures can be altered. The subscapularis tendon is retracted inferiorly to expose the glenoid rim. They report 36 patients in their therapeutic case series. The size of the glenoid defect was less than 25% in 27 patients. In a short follow-up period of minimal 12 months there was an 8% prevalence of recurrent instability and a 9-15 degrees loss of external rotation. In 1954 the Latarjet  procedure was described. Compared to the Bristow procedure a much larger coracoid bone block is used to transfer (2-3 cm) to the anterior-inferior rim of the glenoid. This creates a more robust repair, also because the larger bone block can be fixated with two instead of one screw. This is favourable with a larger glenoid bone loss where the amount of bone transferred by the Bristow procedure may be insufficient or when bone quality is poor. A larger surface of the bone block is added to the glenoid surface because the coracoid is placed with its side lengthwise to the anterior-inferior rim of the glenoid whereas in the Bristow procedure the osteotomy surface is placed on the rim. Fig. (6a-b) show the postoperative X-ray after the Laterjet procedure. A radiographic controlled study was performed by Moon et al. They evaluated 44 patient who underwent Latarjet procedure for large glenoid defects and used CT to calculate the surface areas of the preoperative glenoid defect size and the reconstructed glenoid, besides the clinical results. Two of 44 patients had a recurrence of instability. The preoperative glenoid defect size was 25.3% (+/- 6%) of the intact glenoid. 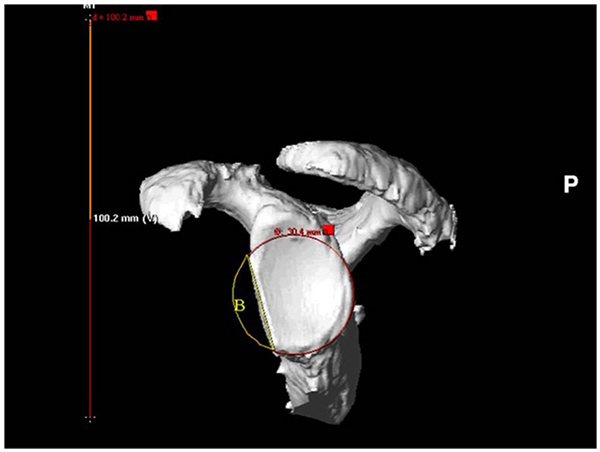 The postoperative coracoid surface was 24.8% (+/- 5%), resulting in a postoperative glenoid defect size of 1.5% (+/- 2%) of the intact glenoid surface. Bhatia et al. did a systematic review on the optimal position and orientation of the coracoid bone graft for the Latarjet procedure in patients with recurrent anterior instability and high degrees of glenoid bone loss. They found 10 studies qualified for inclusion after the original search provided a total of 344 studies. Although not reporting the average bone loss. The follow-up period ranged from 0.5 to 14.3 years postoperatively. Four out of ten studies reported patient satisfaction. The patient satisfaction was good to excellent in more than 90% at final follow-up. The recurrence rate of anterior instability of the shoulder ranged from 0% to 8% and was reported in eight of ten studies. Although there is little consensus in the literature on the optimal position and orientation of the graft, on the basis of the studies from Ghodadra et al. and Burkhart et al. they recommend to position the inferior surface of the coracoid flush with the glenoid surface. The arthroscopic Latarjet procedure is described by Lafosse et al. and experienced minimal complications. The patient group was diverse with significant humeral or glenoid bone loss, or a complex capsular lesion. The procedure is completely performed arthroscopically. The coracoid osteotomy, split of the subscapularis, transfer and fixation with two screws of the coracoid bone block. In a five year follow study by Lafosse  they evaluated 64 shoulders in an operated group of 89 shoulders and found no dislocations, only one reported recurrent instability. The reported patient outcome in WOSI (Western Ontario Shoulder Instability Index) was good. Three patients had a postoperative hematoma and 10 patients returned to the operating room. 8 had prominent screws removed, 1 had a displaced coracoid graft and one patient developed osteoarthritis requiring total shoulder arthroplasty. Griesser et al. performed a systematic review on the complications after Bristow-Latarjet procedure and found a 30% risk of complications. They found a recurrent dislocation in 2.9% and re-operation in 6.9%. The all-arthroscopic technique has a lower risk of re-operation, but a greater loss of postoperative external rotation. Two experienced surgeons performed the all-arthroscopic technique, so their results are not applicable to all surgeons. Although the coracoid transfers have become very popular, the disadvantage is the disruption of the anatomic function of the coracoid. The use of an allograft bone block augmentation preserves this function. (Fig. 5) shows a postoperative CT-scan after an autograft on the anterior glenoid rim, with a screw in place. Fig. (5). CT-image of an autograft bone block, with screw fixation. The Eden-Hybbinette procedure was described by Eden  in 1918 and later by Hybbinette  in 1932. The principal of the described technique is to use a bone graft to reconstruct the anterior-inferior glenoid. Standard practice is to use a corticocancellous iliac crest bone graft which is fixated to the anterior-inferior glenoid. The bone block typically has a size of 2 by 4 cm. mostly fixated with 3.5 mm AO screws. The fixated bone block is than contoured in the shape of the glenoid. In the original procedure a tibial autograft was used placed between the fractured glenoid and detached labrum. Good to excellent results, without recurrent shoulder instability, were reported in 95% of 21 patients, with a follow-up of 8-64 months after an extracapuslular iliac crest graft to the glenoid . In a longer follow-up study with a mean of 29 years (range, 22-37) by Rahme et al. recurrence of instability was reported in 20% of 77 patients. Resulting in 8% re-operation due to persistent instability, with still a good to excellent result in 83% of the patients using the Rowe score . The long term follow-up provided some other interesting information. Most patients had a loss of external rotation, although not clinically relevant. No correlation was seen between the condition of the transplant and the presence of osteoarthritis in the glenohumeral joint. Although radiographs showed resorbed transplants in 22 of 74 shoulders. Five patients had a non-union in this group and 47 of the 74 showed bone to bone healing. These numbers do not change significantly after excluding the re-operated shoulders (43 of 66 healed, 4 of 66 non-unions, and 19 of 66 resorbed). Almost half of the patients developed glenohumeral osteoarthritis. It was not possible to determine whether it was the result of the cartilage damage from recurrent instability prior to repair, direct from the operation or from the relative restriction in post-operative external rotation. The prevalence of postoperative osteoarthritis is similar to that reported by Hovelius et al. in their long-term follow-up of patients undergoing a Bristow procedure. Another study of Hovelius et al. describes the bone healing after 15-years follow-up. 98 (85%) showed osseous healing, migration greater than 5 mm of the transplant was seen in four. Sixteen shoulders showed osteolysis around the screw. The healing of the bone block did not influence osteoarthritis at follow-up . Auffarth et al. described a J-bone shaped anatomical glenoid reconstruction for recurrent posttraumatic anterior shoulder dislocation. They used a bicortical iliac crest bone block including crest and outer cortex and mold in a J-shaped manner. A crevice on the glenoid rim is produced using a chisel to incorporate the graft. The keel is fitted into the preformed crevice with a spiked impactor. The graft's surface is contoured using a high-speed burr. Their follow-up is 90 months on 47 shoulders without recurrence except for one traumatic graft fracture. The mean Rowe scores and the Constant scores of the affected shoulder almost reached the uninjured shoulder (94.3 vs. 96.8 and 93.5 vs. 95 points). An arthroscopic glenoid bone grafting with nonrigid fixation combined with a Bankart or bony Bankart repair is described by Zhao et al. A mean follow-up time of 39 months on 52 patients with recurrent anterior shoulder instability resulted in satisfactory restoration of shoulder stability and a 100% graft healing. They used allogenic bicortical iliac grafts which were tethered to the glenoid by sutures from anchors placed in the glenoid surface, no rigid fixation was used. Another arthroscopic bone graft technique for anterior inferior glenohumeral instability is described by Taverna et al. . It is a completely arthroscopic procedure without rigid (screws) fixation, instead they use special buttons. The iliac crest bone graft is tricortical and is placed on the anterior glenoid neck and fixated with the buttons. A soft tissue (capsular, labral, and ligament) reconstruction with suture anchors on the glenoid rim is performed, leaving the graft as an extra-articular structure. Also the previous described study by Sugaya et al. shows the successful outcome of an arthroscopic osseous Bankart repair with use of suture anchors. Fig. (6). A. X-ray (AP) after Laterjet, B. X-ray (Y-view) after Laterjet. The possible disadvantage of the usage of the allograft bone block is the lack of any cartilage resulting in a possible long-term osteoarthritis. The distal clavicle might have several potential advantages compared to other osseous donor sites. Tokish et al. investigated whether a patients’ ipsilateral distal clavicle could be used as an autograft alternative for bone augmentation in shoulder instability with glenoid bone loss. They state it to be 'an immediately available and low-cost method for anatomic reconstruction of glenoid bone loss'. The native cartilage thickness is favourable as well as the shape which has similarity with the coracoid. It is a pilot study of 8 patients where the authors advise larger studies with longer-term follow-up to evaluate this technique. There are hardly indications for shoulder arthroplasty in the initial management of glenoid defects in anterior shoulder instability. In the literature there are no case series or larger studies, only case-reports which describe reversed shoulder prosthesis after a large glenoid bone defect, mostly associated with humeral head defects, Hill-Sachs lesions. [62, 63]. The management of glenoid defects in anterior shoulder instability consists of conservative or operative treatment. Based on the current available literature we advise to begin management of traumatic anterior shoulder instability combined with glenoid defects with conservative treatment. This often results in satisfactory outcome. Operative treatment can be used when the bone fragment consists of a large glenoid surface and the patient is active, or in the case of a chronic defect or recurrent instability. Different described operative treatments have a satisfactory outcome in selected patients. An advise which surgical technique to perform based on the size of the glenoid bone defect cannot be given based on current literature. Also, the diagnostics of the presence and size of a glenoid bone defect is still debated on in literature. Sugaya H, Moriishi J, Dohi M, Kon Y, Tsuchiya A. Glenoid rim morphology in recurrent anterior glenohumeral instability. J Bone Joint Surg Am 2003; 85-A(5): 878-84. Schrumpf MA, Maak TG, Delos D, et al. The management of anterior glenohumeral instability with and without bone loss: AAOS exhibit selection. J Bone Joint Surg Am 2014; 96(2): e12. Ochoa E Jr, Burkhart S. Bone Defects in Anterior Instability of the Shoulder: Diagnosis and Management. Oper Tech Orthop 2008; 18: 68-78. Itoi E, Lee SB, Berglund LJ, Berge LL, An KN. The effect of a glenoid defect on anteroinferior stability of the shoulder after Bankart repair: a cadaveric study. J Bone Joint Surg Am 2000; 82(1): 35-46. Huijsmans PE, de Witte PB, de Villiers RV, et al. Recurrent anterior shoulder instability: Accuracy of estimations of glenoid bone loss with computed tomography is insufficient for therapeutic decision-making. Skeletal Radiol 2011; 40(10): 1329-34. Mologne TS, Provencher MT, Menzel KA, Vachon TA, Dewing CB. 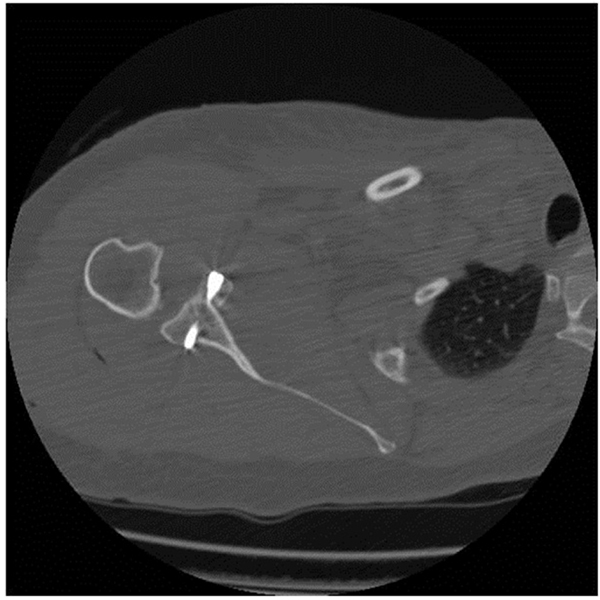 Arthroscopic stabilization in patients with an inverted pear glenoid: results in patients with bone loss of the anterior glenoid. Am J Sports Med 2007; 35(8): 1276-83. Longo UG, Loppini M, Rizzello G, Romeo G, Huijsmans PE, Denaro V. Glenoid and humeral head bone loss in traumatic anterior glenohumeral instability: a systematic review. Knee Surg Sports Traumatol Arthrosc 2014; 22(2): 392-414. ONeill DB. Arthroscopic Bankart repair of anterior detachments of the glenoid labrum. A prospective study. J Bone Joint Surg Am 1999; 81(10): 1357-66. Piasecki DP, Verma NN, Romeo AA, Levine WN, Bach BR Jr, Provencher MT. Glenoid bone deficiency in recurrent anterior shoulder instability: diagnosis and management. J Am Acad Orthop Surg 2009; 17(8): 482-93. Maquieira GJ, Espinosa N, Gerber C, Eid K. Non-operative treatment of large anterior glenoid rim fractures after traumatic anterior dislocation of the shoulder. J Bone Joint Surg Br 2007; 89(10): 1347-51. Lo IK, Parten PM, Burkhart SS. The inverted pear glenoid: an indicator of significant glenoid bone loss. Arthroscopy 2004; 20(2): 169-74. Itoi E, Hatakeyama Y, Sato T, et al. Immobilization in external rotation after shoulder dislocation reduces the risk of recurrence. A randomized controlled trial. J Bone Joint Surg Am 2007; 89(10): 2124-31.
 te Slaa RL, Wijffels MP, Brand R, Marti RK. The prognosis following acute primary glenohumeral dislocation. J Bone Joint Surg Br 2004; 86(1): 58-64. Sugaya H, Moriishi J, Kanisawa I, Tsuchiya A. Arthroscopic osseous Bankart repair for chronic recurrent traumatic anterior glenohumeral instability. J Bone Joint Surg Am 2005; 87(8): 1752-60. Huysmans PE, Haen PS, Kidd M, Dhert WJ, Willems JW. The shape of the inferior part of the glenoid: a cadaveric study. J Shoulder Elbow Surg 2006; 15(6): 759-63. Osmond-Clarke H. Habitual dislocation of the shoulder; the Putti-Platt operation. J Bone Joint Surg Br 1948; 30B(1): 19-25. Kiss J, Mersich I, Perlaky GY, Szollas L. The results of the Putti-Platt operation with particular reference to arthritis, pain, and limitation of external rotation. J Shoulder Elbow Surg 1998; 7(5): 495-500. Salomonsson B, Abbaszadegan H, Revay S, Lillkrona U. The Bankart repair versus the Putti-Platt procedure: A randomized study with WOSI score at 10-year follow-up in 62 patients. Acta Orthop 2009; 80(3): 351-6. Wellmann M, Petersen W, Zantop T, et al. Open shoulder repair of osseous glenoid defects: Biomechanical effectiveness of the Latarjet procedure versus a contoured structural bone graft. Am J Sports Med 2009; 37(1): 87-94. Giles JW, Boons HW, Elkinson I, et al. Does the dynamic sling effect of the Latarjet procedure improve shoulder stability? A biomechanical evaluation. J Shoulder Elbow Surg 2013; 22(6): 821-7. Helfet AJ. 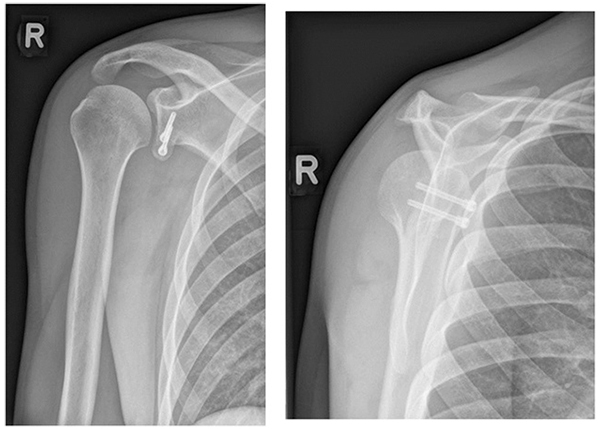 Coracoid transplantation for recurring dislocation of the shoulder. J Bone Joint Surg Br 1958; 40-B(2): 198-202. Yamashita T, Okamura K, Hotta T, Wada T, Aoki M, Ishii S. Good clinical outcome of combined Bankart-Bristow procedure for recurrent shoulder instability: 126 patients followed for 26 years. Acta Orthop Scand 2002; 73(5): 553-7. Hovelius L, Sandström B, Sundgren K, Saebö M. One hundred eighteen Bristow-Latarjet repairs for recurrent anterior dislocation of the shoulder prospectively followed for fifteen years: study Iclinical results. J Shoulder Elbow Surg 2004; 13(5): 509-16. Schroder DT, Provencher MT, Mologne TS, Muldoon MP, Cox JS. The modified Bristow procedure for anterior shoulder instability: 26-year outcomes in Naval Academy midshipmen. Am J Sports Med 2006; 34(5): 778-86. Boileau P, Bicknell RT, El Fegoun AB, Chuinard C. Arthroscopic Bristow procedure for anterior instability in shoulders with a stretched or deficient capsule: the belt-and-suspenders operative technique and preliminary results. Arthroscopy 2007; 23(6): 593-601. Latarjet M. [Treatment of recurrent dislocation of the shoulder]. Lyon Chir 1954; 49(8): 994-7. [in French]. Moon SC, Cho NS, Rhee YG. Quantitative assessment of the latarjet procedure for large glenoid defects by computed tomography: A coracoid graft can sufficiently restore the glenoid arc. Am J Sports Med 2015; 43(5): 1099-107. Bhatia S, Frank RM, Ghodadra NS, et al. The outcomes and surgical techniques of the latarjet procedure. Arthroscopy 2014; 30(2): 227-35. Ghodadra N, Gupta A, Romeo AA, et al. Normalization of glenohumeral articular contact pressures after Latarjet or iliac crest bone-grafting. J Bone Joint Surg Am 2010; 92(6): 1478-89. Burkhart SS, De Beer JF, Barth JR, Cresswell T, Roberts C, Richards DP. Results of modified Latarjet reconstruction in patients with anteroinferior instability and significant bone loss. Arthroscopy 2007; 23(10): 1033-41. Lafosse L, Lejeune E, Bouchard A, Kakuda C, Gobezie R, Kochhar T. The arthroscopic Latarjet procedure for the treatment of anterior shoulder instability. Arthroscopy 2007; 23(11): 1242.e1-5. Griesser MJ, Harris JD, McCoy BW, et al. Complications and re-operations after Bristow-Latarjet shoulder stabilization: a systematic review. J Shoulder Elbow Surg 2013; 22(2): 286-92. Eden R. Zur Operation der habituellen Schulterluxation unter Mit-teilung eines neuen Verfahrens bei Abriss am inneren Pfannernrande. Dstch Ztschr Chir 1918; 144(3-4): 269-80. Hybbinette S. De la transplantation d'un fragment osseux pour remendier aux luxations recidivantes de l'epaule: constatioins et resultats operatoires. Acta Chir Scand 1932; 71: 411-45. Churchill R, Moskal M, Lippitt S, Matsen F III. Extracapsular anatomically contoured anterior glenoid bone grafting for complex glenohumeral instability. Tech Shoulder & Elbow 2001; 2(3): 210-8. Rahme H, Wikblad L, Nowak J, Larsson S. Long-term clinical and radiologic results after Eden-Hybbinette operation for anterior instability of the shoulder. J Shoulder Elbow Surg 2003; 12(1): 15-9. Auffarth A, Kralinger F, Resch H. Anatomical glenoid reconstruction via a J-bone graft for recurrent posttraumatic anterior shoulder dislocation. Oper Orthop Traumatol 2011; 23(5): 453-61. Zhao J, Huangfu X, Yang X, Xie G, Xu C. Arthroscopic glenoid bone grafting with nonrigid fixation for anterior shoulder instability: 52 patients with 2- to 5-year follow-up. Am J Sports Med 2014; 42(4): 831-9. Taverna E, Dambrosi R, Perfetti C, Garavaglia G. Arthroscopic bone graft procedure for anterior inferior glenohumeral instability. Arthrosc Tech 2014; 3(6): e653-60. Anakwenze O, Huffman G. Recurrent shoulder instability and arthritis treated with graft jacket resurfacing, hemiarthroplasty, and bone grafting. Orthopedics 2011; 34(2): 140. Díaz Miñarro J, Izquierdo Fernández A, Muñoz Reyes F, Carpintero Lluch R, Uceda Carrascosa P. 2014.